The Federal Government can pay off the National Debt in 30 years by making interest and principal payments of $699,013,323,930.52 per year. 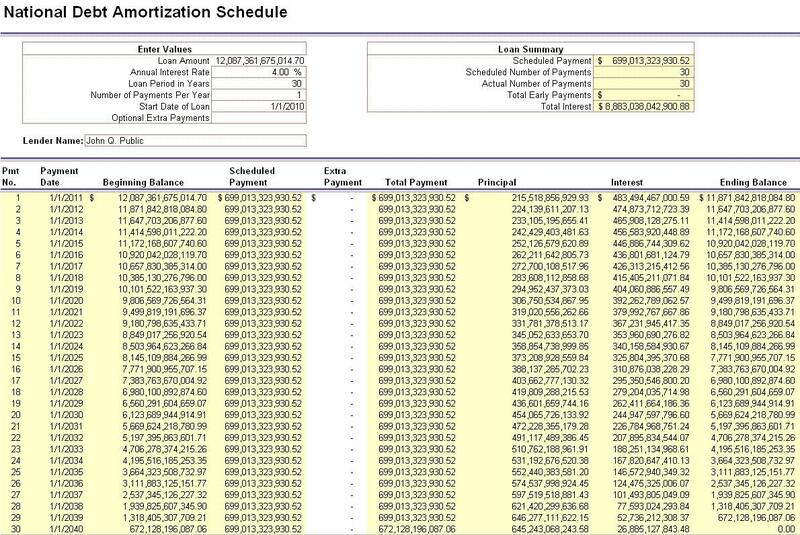 In Fiscal Year 2009 the government made interest payments of $383,656,592,545.78. So it would only take another $315,356,731,384.74 per year, or about $1,051 per capita to completely extinguish the debt. Since this will cost $8,883,038,042,900.88 in interest (at 4% over 30 years), I would suggest that you get started right away. If you politicians were serious about fiscal responsibility, surely you could find a way to cut spending by $315,356,731,384.74 per year. I mean after all, many of you are claiming that more than that is wasted on Medicare each year. The only condition for taking this bold step is that you stop deficit spending ‘now’. Pay the debt, end the deficits, stop making excuses, and quit playing games. There is No debt crisis,..
Only a Crisis of IGNORANCE. PS. When you are done reading 'Capital Homesteading', I would like to send you a copy of “In Defense of Human Dignity” I think it even better in explaining the 'Justice Third Way' movement. Put another nail in the wall, when you read that one. Thanks. I will put another nail in the wall when I'm done.